This thread is for the discussion of "Little House in the Big Woods"
Okay everyone, we are starting with Book one in the series. 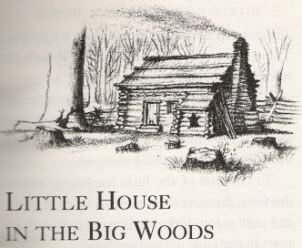 CHAPTER 1: "Little House in the Big Woods"
*What are your thoughts on this chapter? Anything you didn't like? What caught your attention? Rhonda, I think what you put is from 'Little House on the Prairie' because they are in Wisconsin in this book. Laura was born in 1867 and she wrote this first book when she was 60 years old. I don't think she had any idea how famous her books would become. Anyway, I really liked the first chapter. I can see from this chapter that they are a very loving family. Pa takes good care of his family, making sure they have food for the winter. It sure was a lot of hard work back then! Now you can just go to the store and buy the meat you need, whenever you want. But in Laura’s days, you could see there was a ton of work they had to do with cutting, preparing and storing the meat. I think that is why they appreciated things more back then, they saw the hard work it took them. I thought it was funny how Laura had a “doll” named Susan who was really a corn cob…, but like she said “it wasn’t her fault she was a corn cob”. LOL That’s too cute. *Rhonda, I hope you feel better!!! It was so sweet of Pa though to explain to her that it didn't hurt him because it was done quickly. Yep, and Pa blowing up the bladder and them playing with it like it was a balloon! And eating the pig's tail. the way they describe it cooking, it even makes me hungry! This is one thing I love about the books. They made their own fun and it didn't cost anything. They played games, sang and danced and had a great time. I think the first chapter really shows how hard they had to work to get enough food for the winter. I really like how Laura explains how everything was done. It is a look back to the past. I feel sorry for Laura that she only had a corn cob for a doll, but I admire that she used her imagination and loved 'Susan' just the same. Yeah, that bladder sure proved useful. I had an great aunt in El Salvador who was not afraid to kill the animals.... You name, she would kill it. LOL Pigs, chickens, turkeys.... whatever, and she would prepare some delicious meals. I have a great cookbook I could give you some recipes from, then, Carol: 365 Ways to Cook Chicken. That's a good point, Carol - they did what they had to, to survive. I can't imagine shooting a deer for meat. Not that I think it's wrong. I don't, as long as it's for meat, and not just sport. I just don't think that I could do it. But if my family was starving . . . . that's another story. Bye-bye Bambi. My grandpa, go lived in the country, in Argentina, told me the same than Laura wrote in this book. He used to play with the pig bladder as the girls did, and he didn't like to hear the pig squeals and he covered his ears like Laura...He didn't want to hear the pig squealing! Howver, he liked eat its meat, and he never thought in becoming a vegetarian! My great-grandmother, when living in country-yard didn't like to kill herselg the chicken to coock them, but she MUST do it, She was a nice ladylike woman..Very much like Nellie! The first time she killed a chicken, she cut her head off...And she was horrified when she saw the chicken stating to run away..WITHOUT his head! LOL....As busy as life is these days, I'm sure you will see me running around like a chicken with its head cut off!!! I am constantly running in circles just to get the daily stuff done....WHEW!!!! You make me laugh, people! What an hysterical-hylarious thread!!! I liked the way Laura described the smoking process. It must have smelled wonderful around their house when the deer was being smoked. I think that maybe one of the reasons that Laura writes about the amount of food that they had in this chapter is to compare to later books, like the Long Winter, when they had very little. Can't you just see the two little girls playing in the attic with all of the produce hanging and sitting around them. What fun they must have had. I love this book. This is going to be fun! I know exactly what you mean, because I can remember when my sisters and I were young, we could find all sorts of places to play, and with imagination, you can go anywhere and be anything.......It had to be so cozy up there with all the supplies in the attic, not to mention colorful!!! I don`t think a vegetarian would have lasted long in those days. Especially in the winter. They had to get by on what they had. I also thought it would have been interesting to have a pig bladder for a balloon. I live on a small farm and we have killed chickens. And I have joined in on eating them. My Mom will not though. She says she won`t eat things that she has seen alive. Even in these times most of my family and I eat venison and other meat from animals we have killed ourselves. Though it isn`t very often but it does not bother us. We enjoy the taste and the feeling of providing for ourselves. 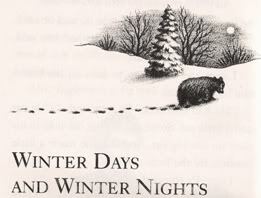 CHAPTER 2: "Winter Days and Winter Nights"
I like how Laura says: "But the best time of all was at night, when Pa came home"
We first hear Laura's nick name when Pa calls for her saying, "Where's my little half-pint of sweet cider half drunk up?" lol.... that's too cute. In this chapter, you can see how close the family is and how well they work together to get things done. Pa spent his days hunting in order to have food for Ma to prepare and the family to eat. The girls helped Ma with the chores and Ma in turn, helped the girls with little games so they weren't always working. I think using Ma's thimble on the frosted window was neat and how they could make patterns and play with the windows in that way. When we were growing up, you didn't dare blow your breath on the window and make pictures and stuff. We did it anyway, especially in the car, but we had to clean it up too....LOL I also liked how Ma had her little saying for each chore that needed to be done each day of the week. I loved Pa's stories and how he spent time playing with the girls, when you know he was tired from hunting all day. I thought it was an interesting process that Ma took to color the butter because it wasn't the color that it should be in the winter time that it is in the summer time. And I love how Ma would make paper dolls for the girls to play with...What a family!!! Ain't that the truth!!! I couldn't find any butter churning!!! LOL... that' too cool Rhonda. It seems like the bake and clean days are backward. I'd have to clean all over again after baking. I love this chapter, for it teach you a lot of livelihood in those days. I like how Laura depicts how Ma would make her chores and teach the girls how to do them too, little by little. These relationships between mother and daughters can't bee seen anymore. Because of this, girls of nowadays didn't know how to coock, or sew a button. It's very important too, the relationships between Charles Ingalls and her daughters. He was a very kind man, who could play with Mary and Laura as he was a child himself. And yes...I love "Mad Dog"!!!!! I love Ma's daily chores list. I have tried to use that in my life but so far it hasn't worked lol I admire so much how hard they worked and how they enjoyed and appreciated every thing they had. Yep...Perhaps, we have too much material things nowadays. "The lamp was bright and shiny. there was salt in the bottom of its glass bowl with the kerosene to keep the kerosene from exploding and there were bits of red flannel among the salt to make it pretty. 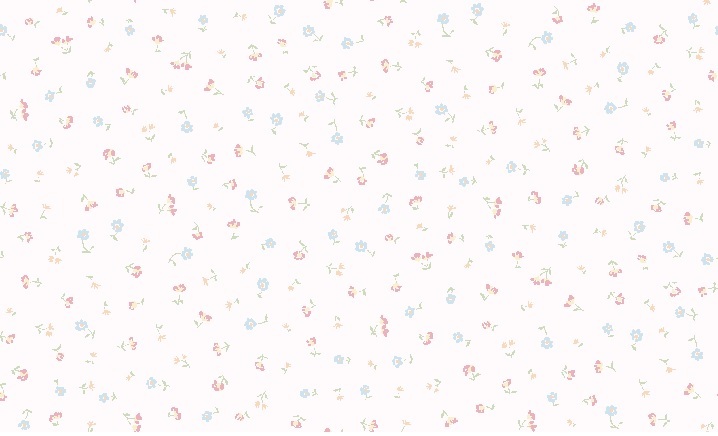 It was pretty." Do you think it would have exploded because of the cold? I love how Ma's house was always pretty. In each book Laura describes what the rooms look like so we can imagine a little bit. I never thought of that... that's interesting. I read somewhere that people would polish their Kerosene lamps with salt though.. for a brighter look. Dipping a platinum wire in salt solution and holding it in a gas flame which would turn the flame from almost invisible blue to bright yellow. I read that putting salt in the kerosene was supposed to remove carbon, and increase the intensity of the light. Now, whether that's true or not, I'm not sure. But it would be interesting to find out. I also read that the salt in the kerosene tended to cause corrosion (on the burners) if the lamps weren't kept very clean. Cleaning the lamps would have been a very important job, then. Because if you were out in the middle of nowhere and your lamp's burner became too corroded for use, you couldn't just walk to the store and buy a new one. You bet! That is one of the reasons Christmas sometimes depresses me people worry too much about material things and some children probably don`t even know the true meaning. My Dad collects hurricane lanterns and oil lamps. We used one tonight! Mostly we used them when we sit outside at night in the Summer and Fall. CHAPTER 3: "The Long Rifle"
Pa cleans his rifle in this chapter and the girls like helping him. Come on all you readers and bookworms.... where are ya? I will add to this later...It has been CrAzY here at work.....Posting on the board has almost been impossible!!! I'm sure your boss would understand completely if you devoted all your time to the board Rhonda!! LOL Maybe in a perfect world :tapdance: . Just to let you know Carol I plan ordering the books this week. So, I'll be able to join in on all this action. This chapter shows what a good father Charles is. He get the girls to help him clean the rifle so they can know that their Pa is safe in the woods each day. Then after the work is done they can have their storytime. I don't think Ma is even mentioned in this chapter, is she? I love the LH books. I hope that we read them all together. I might take a while though. That's ok with me. Ma is mentioned, but only that she had made Pa a bullet pouch out of buckskin to store his bullets in. I think it is interesting the detail that Laura remembered of how Pa made the bullets, how he cleaned the rifle and how he got is ready to go out hunting again. She seemed to have been impressed with it all to remember every detail. I also like how Pa could tell stories to the girls that they loved and remembered. I often wondered if this is where Laura got her talent for describing things to Mary and then later on writing. Pa's stories seem to come alive and jump off the page as you read about him being "naughty little boy" and how the girls loved to hear that story about their Pa. Funny how children love to learn that their parents got in trouble too! Just reading the title of this book makes me feel warm, cozy and happy! I love this book. I remember reading the series for the first time in grade 7 after I found the show on tv. I can still remember where they were in the school library. Even looking at the covers of the books give me a funny thrill. I can't explain it. I'd really like to live out in the woods, in a little cabin. I think it would make my dog nervous, lol, but *I* would enjoy it. This book is a little jewel to me. It warms my heart every time I read it and I can understand why it was a favorite when it was published for the first time. The sense of coziness, family care and wilderness is in every page of it. Laura is only a little girl there, but the whole story is so sweet...Pa's stories, the mad dog, the sugaring off...There's a kind o magic inside "Little House in the Big Woods"
Ok. You ladies settled it. I was going to post a thread asking which book to read first but I think I have my answer. This is my favorite book. I'm game, too. I'll love lived in the woods. This book es one of my very favorites. Never get tired of re-read it. 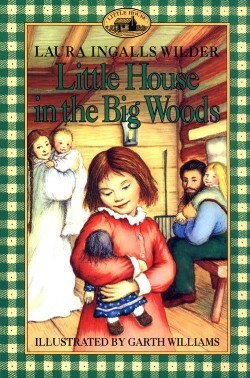 I just loaned this book to a coworker who has never read the Little House books. She devoured it in one night. I took her the next 3 to keep her busy over the weekend. It is so awesome to share these books with new fans. I found a picture for you Lisa! Thank you, Carol! One of life's mysteries has now been solved for me! Ok, I'm going to gross you out! I saw a 15 year old pig bladder at Laurapalooza this summer. One of the ladies who do Laura presentations had 2 of them. One was blown up and the other wasn't. The deflated one looked all shriviled up like you would think it was supposed to look but the one with air in it looked very cool and I can see how the Ingalls girls would have had a lot of fun with it. Subject: Re: "LITTLE HOUSE IN THE BIG WOODS"